At one point I turned left down a long, narrow street. To my eye it looked like an alley, not more than five feet wide. The sets of buildings on either side of it shared walls, so there was no break between residences or businesses. Flying buttresses connected the two sides. Cats sat on top of them and eyed me as I passed under. About fifty feet in the lane bent to the left. In another hundred feet it intersected with a street, and standing there appeared to be three men, hands in pockets, all black in shadow. Even though I couldn’t see their faces, it was clear they were looking in my direction. They weren’t doing anything, just standing, waiting, watching. Unease filled me. Three strange men hanging out in an alley…Do I go back? Just turn around? That didn’t seem smart, showing fear. Instead, I walked forward like I knew where I was going, that I belonged here. But there was something else up ahead. On the left hand side of the building, before the intersection, I saw a sliver of light and heard a slight rumble, like people talking. Maybe there is a shop open, I thought. I can duck in there and wait for the three toughs to go away. A few feet from the light, I realized it wasn’t a shop, but an open doorway. Like others in the old town, it was arched and low, not more than five feet high. A chair and a small glass case with two shelves blocked the doorway. Both the shelves and chair held plates of raised sugar donuts. Some of the donuts were twists, others round with holes. There was no sign, no price list, just the donuts. A small, two burner stove stood against the wall behind the case. Two cast iron skillets sat on top of it. In another room, beyond this tiny kitchen, three old men on a couch talked passionately. Next to them a television broadcasted a talk show but the sound was off. I know no Greek, but given the flailing arms and strained faces I’d be surprised if they weren’t bantering about politics; the Greek prime minister had resigned the day before, and all cities stood on riot alert. A woman sat in a chair opposite the couch. The woman got up and smiled. I held up a finger and pointed to one of the round donuts. As she fished it from the case I dug in my pocket for small change. 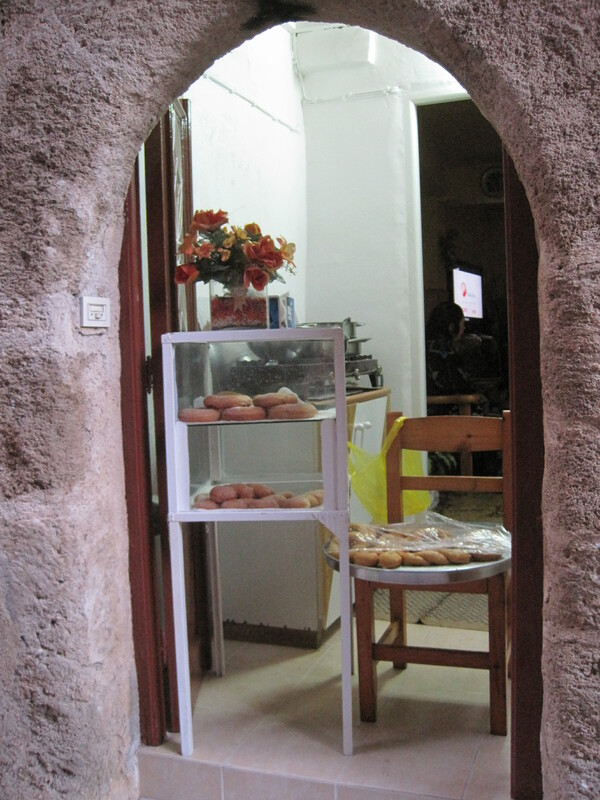 How much could a donut sold out of a little house in the back alleys of Rhodes Old Town possibly cost? Certainly more than the fourteen cents I had in coin. I held out a 20 Euro note. “No problem.” She took the note, gave me the donut and headed back into the television room, where she rifled through a small box. She said something to the men, who immediately stopped talking and rooted through their pockets, each one giving the woman their find. She came back and handed me a 10 Euro note and a stack of coins. One of the men waved goodbye before dropping back into his conversation. I continued towards the intersection, munching on my donut. The three figures were still there, and one still faced me. Another held something in his hand. He and the other guy were looking at it. I slowed my pace a bit. Suddenly I felt silly, a grown man eating a donut when he is about to get jumped in a dark alley. But that didn’t happen. The three “toughs” turned out to be kids, not more than fourteen years old. As soon as I reached them, one hopped on a moped and sped away. The other two were too busy laughing at something in a notebook to notice me and my donut. Mark Lewandowski’s essays and stories have appeared in many journals, and have been listed as “Notable” in The Best American Nonrequired Reading, The Best American Travel Writing, and twice in The Best American Essays. His story collection, Halibut Rodeo, was published in 2010. Currently he is Associate Professor of English at Indiana State University. He’s taught in Poland as a Peace Corps Volunteer and in Lithuania as a Fulbright Senior Scholar.